PLEASE LEAVE A NOTE ON ONLINE ORDERS FOR SPECIFIC TIME: This discount is for all the customers who order online. Please use this VSPICE15 code on your checkout to get the discount. This does not apply on meal deals. Terms and condition apply. 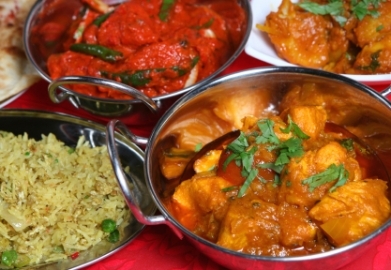 Our menu is lightly seasoned to appeal to all but can be ''spiced'' up on request. If any of your favourite dishes are not listed in our menu please do not hesitate to ask, we will cook up whatever you desire. We have earned rave reviews and awards for our efforts to bring you the best from the Indian sub-continent, including such esteemed prizes as the MasterChef Gold Award and 4-Star Good Food Guide & Customer Excellence Awards Winner. As well as these acclaimed awards we have been recognised for our basic principles. Perfect as usual thank you. Copyright 2019 Village Spice. All Rights Reserved.